This listing features a teardrop multi color flash labradorite(35x28x10mm), a moonstone cabochon measuring 7x5mm. I used copper wire to make the frame and bail. Labradorite is a gemstone of magic; this crystal has been used by shamans and healers for generations. It helps those seeking knowledge and guidance to find answers. It is excellent for awakening your life's purpose, intuition and psychic abilities. 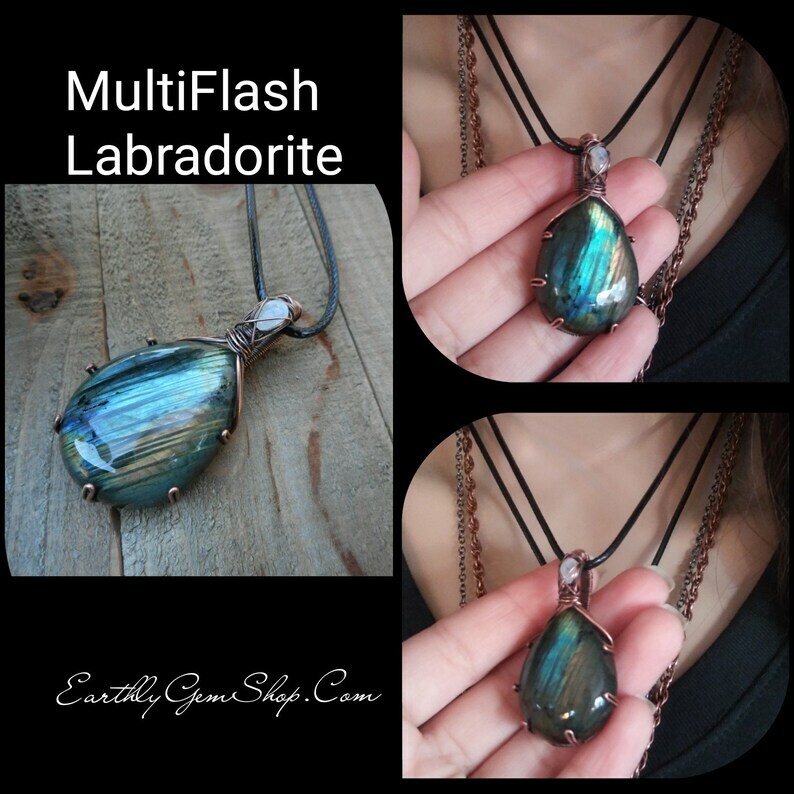 Labradorite is a powerful crystal for protection. Rainbow Moonstone acts as a prism, diffusing energy throughout the aura. It provides psychic protection, clearing the mind and senses, and aids in lucid dreaming and calm sleep. It deflects negativity and eases emotional trauma. The history of wire wrapped jewelry can be dated way back to 1446 BC. Researchers have found elements of wire jewelry in ancient pharaohs' tombs and pyramids in Egypt. Early wire used for wire jewelry was made by metal that was pounded flat into sheets which were then cut into strips and rolled into tubes. It appears that gold was most likely the first metal used to make wire for wire wrapped jewelry, as it was easily hammered into thin sheets. Get 10% off your order when you spend $40 at this shop. Discount shown at checkout. The pendant is wonderful too.the package is sober and refined. The pendant is wonderful. the package is sober and refined. thank you for the partial reimbursement of shipping costs. I use rennaissance wax to protect copper jewelry before shipping. Some people use coconut oil, beeswax and clear nail polish for copper rings. I did try the nail polish for my copper rings and it works great. Please avoid water since it will create natural patina to the copper. A polishing cloth works great also even for the wire wrapped jewelry, silver and copper electroformed. Please note that I have the right to refuse custom work to anyone. If you need a custom order, contact me to see if I'm able and available to satisfy your needs. All custom work has to be paid in full before shipping. Thank you for understanding.